The programme provides children with the opportunity to try tennis, and to get involved with the event through academic and sporting activities. Dubai Duty Free Tennis Championships mascots Ace and Annette at the Horizon International School Dubai. February 15, 2019 – Dubai, UAE: Schools across Dubai have been getting into the swing of things in the lead up to the Dubai Duty Free Tennis Championships, with nearly one thousand children from 11 schools participating in the Partner Schools Programme. Schools across the emirate have been invited to participate in the programme, which was developed to create a legacy from the Championships by providing children with the opportunity to try tennis, and to get involved with the event through academic and sporting activities and through participation in the always popular J.P. Morgan Kids’ Days. The eleven selected Partner Schools have been visited in the weeks leading up to the tournament with the students participating in a tennis taster clinic with teachers and coaches, playing the Championships tennis inflatable game, meeting the mascots Ace and Annette, and seeing the trophy. Schools who participate in the programme are also invited to the J.P.Morgan Kids’ Days on Mondays of both the WTA and ATP week. In addition, Partner Schools are invited to nominate children between the ages of 11-18 years to be part of the “Junior Reporter” programme. The selected children are given the opportunity to participate in post-match press conferences and to ask a question of one of the tennis players during their interview. The Junior Reporter will also have a photograph taken with the player, and be given a tour of the media room. And in a new initiative this year, the first ever Tennis Academy Youth day will be conducted on the first day of the tournament. The day will offer over 500 students at Tennis Emirates affiliated academies the opportunity to participate in a tennis skills and drills clinic, and the chance to interact with some star tennis players. 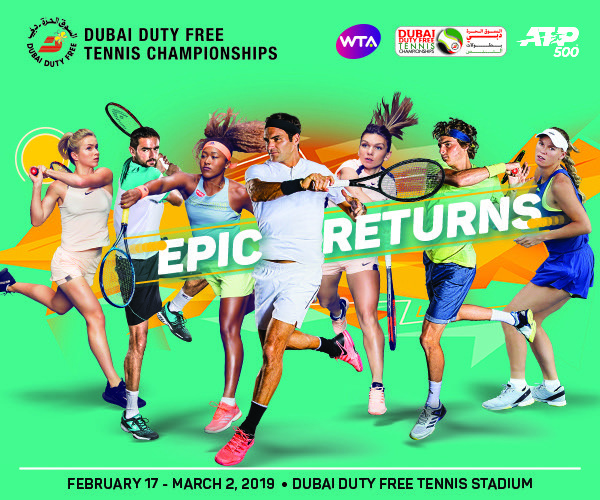 Two weeks of spectacular entertainment begins with the WTA event which takes place 17th to 23rd February, which features an incredible nine of the world’s top 10, led by reigning US and Australian Open champion and world No. 1 Naomi Osaka. Among others competing are two-time Wimbledon champion Petra Kvitova, 2018 Australian Open winner Caroline Wozniacki, French Open champion Simona Halep, treble Grand Slam winner Angelique Kerber, two-time Dubai champion Elina Svitolina, 2019 Brisbane winner and Australian Open semi-finalist Karolina Pliskova and former Grand Slam champions Garbiñe Muguruza and Jelena Ostapenko. The sensational week of women’s tennis will be followed by an equally thrilling men’s event commencing on 25th February, and concluding on 2 March. The men’s field features seven-time champion Roger Federer, Australian Open semi-finalist Stefanos Tsitsipas, defending champion and recent Doha winner Roberto Bautista Agut, former US Open winner Marin Cilic and two-time finalist Tomas Berdych. Borna Coric, Ricardas Berankis, and John Peers joined tournament director Salah Tahlak in interacting with the 1,000+ school children from across the UAE in attendance.